Inside No 9, the macabre new comedy penned by The League of Gentlemen’s Reece Shearsmith and Steve Pemberton, shares the hallmarks of their last offering, the terrific Psychoville; it’s familiar but uncanny, funny but unsettling, a joy to watch but at the same time ever so slightly distressing. 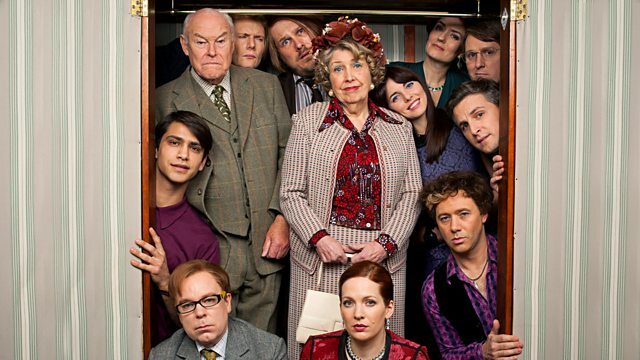 At the doomed engagement party of repressed Rebecca (The IT Crowd’s Katherine Parkinson) and dullard Jeremy, a game of ‘sardines’ takes place inside an antique wardrobe which looms over a bedroom filled with symbolic old baggage. The episode is set entirely within this bedroom, giving a claustrophobic atmosphere which intensifies as each character in turn squeezes into the wardrobe. The cast is impressive, from Anna Chancellor and Julian Rhind-Tutt’s randy posho couple to Marc Wootton’s ‘Stinky John’, a man so traumatised by some past event that he cannot bear to bathe. Shearsmith is reliably excellent as aggressively gay Stu, slinking about and speaking with a campness bordering on the vicious, making innuendos about ‘having wood’ and ‘secreting himself’. Pemberton’s portrayal of Stu’s closeted lover Carl is a master-class in simmering resentment and suppressed horrors. Tim Key is quietly brilliant as IT man Ian, looking like a worm in a suit, blinking behind naff spectacles and saying wholly inappropriate things in a creepily butter-soft voice. Key and Shearsmith get the best lines but there is some subtly brilliant physical comedy going on, especially from Parkinson, whose facial expressions steal scenes. Everything about the look of this episode is spot-on, from the hair and make-up to the costumes and set design, and the scratchy violins of the incidental music add to the oppressive, eerie feel of the place. Each episode of Inside No 9 is a self-contained story, so it’s not really a series in the conventional sense, more like a collection of one-offs. This anthology style mirrors that of Roald Dahl’s Tales of the Unexpected (1979-88), a comically gruesome series with twist endings which clearly influenced Shearsmith and Pemberton. Future episodes are bound to share the same grimly comedic tone, but the introduction of a new narrative each time ensures an unpredictability which suits the unhinged subject matter. The sting in this episode’s tail is satisfyingly sinister, prompting shudders and smiles in equal measures, a pleasurable combination which has come to be expected of Shearsmith and Pemberton. Long may their creative partnership give us goosebumps.